I started building a starter for a weekend bake over the past few days, but on Friday morning got a bit ahead of myself and created a bigger amount of starter than I normally do.. I find feeding 1:4:4 works for my kitchen temp and starter strength when I'm feeding every 12 hours.. but then I came home late Friday night to this.. 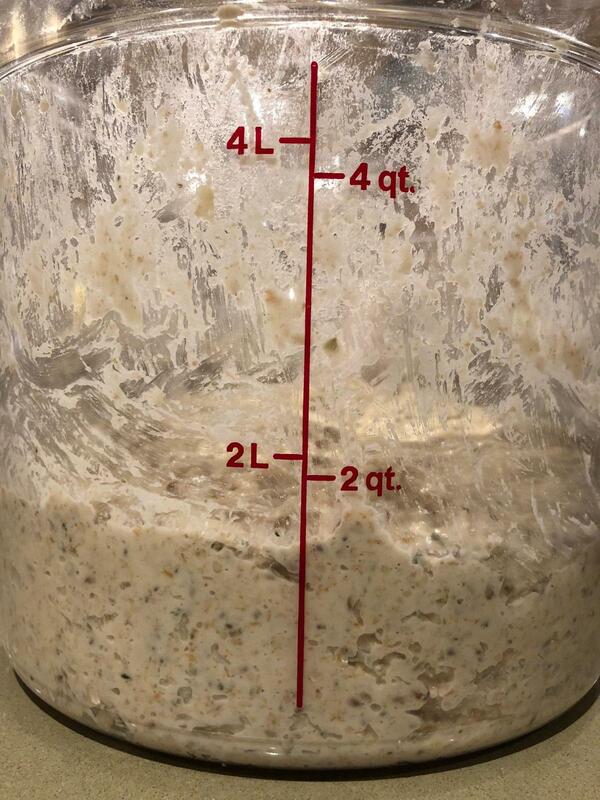 It was about 500+ grams of starter that by this stage had more than trippled.. I guess on the one hand I should be happy to have a virbrant and active starter! So I decided to put it to good use but didn't have a formal plan. 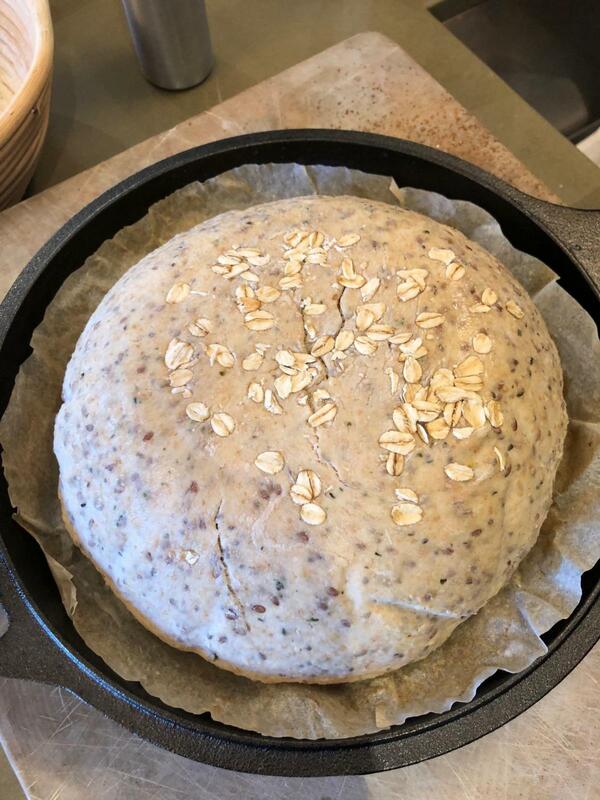 So I added 800g of unbleached bread flour, 200g of whole wheat flour, 720g of water (autolysed for about an hour), 200g of starter, 20g of fine sea salt. I mixed this well and then thirty minutes later I added 100g of hemp hearts, 100g of brown flax seeds, 100g of oat bran (all three were toasted), 25g of chia seeds and 50g of amber honey. I gave it all a good mix and did so again thirty minutes later. But it was already late and the night's scotch was starting to make me sleepy! I decided to leave it on the counter for the night given the amount of additions.. it looked like this..
By the next morning I woke up to this.. It looked good and obviously rose well. But had little structure as I didn't give it much by way of stretch and folds. I thought of it as a no-knead experiment.. I poured it out on my bench and it deflated a fair amount in the process despite my best gentle efforts. I pre-shaped and then shaped it into a few loaves to proof in baskets. I left them on the counter for almost four hours and they probably rose around 75% or so.. i always find it hard to know for sure..
Loading the proofed loaf into the combo cooker.. as I put it in the basket seam side down I didn't score the loaf.. (probably should have just the same).. Here they are out of the oven.. The aroma while they baked was earthy and great. The crumb is dense but not overly wet or under-cooked. It's just not open and is heavy. It's very tasty, good and better toasted, but not ideal. So my question is to ask: is this more about too much additives by weight of dough, or process? Can you make a more open/lighter crumb with this much in additions or did I cross the limit and added too much? Or was this about process, and by not creating structure with stretch and folds and making this an overnight no-knead that the outcome was inevitable? 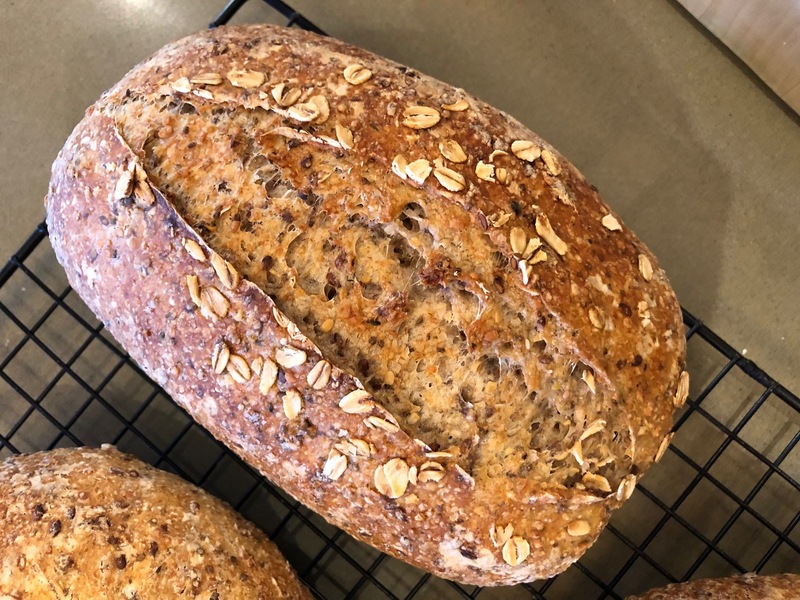 however, Hamelman’s 5 grain levain is about 33% grains in a soaker, and my other favourite multigrain loaf has a similar mixed grain soaker so I don’t think you have too many additives. my flours are much weaker and I add gluten flour to boost it a bit, your flours should be ok.
For a large, unplanned, complex, SD loaf, they turned out beautiful. I would never have expected an open crumb with the additives. I would have hoped for a higher rise with the bread flour. I believe the S&F would probably have helped but you still have beautiful loaves! I would slice thin, toast or not toast, and enjoy! Thanks Leslie and Clazar.. As I've thought of it I think it could be a bit of both. 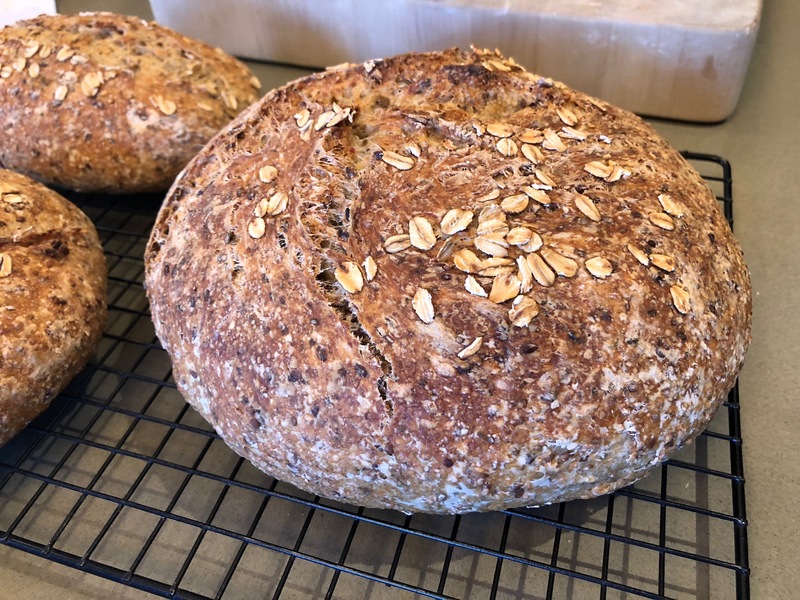 Because the oatbran isn't a seed - my suspicion is that the absorption of water by the oat bran probably affected the crumb more than would have it's replacement with sunflour seeds or the some other true whole seed. And probably a developed structure would have helped the rise open the crumb a touch more as well. Thanks to both! That is certainly no where near the max limit of additions, although I would have soaked them in an ideal world. Looks like you actually achieved good structure in the final shape. 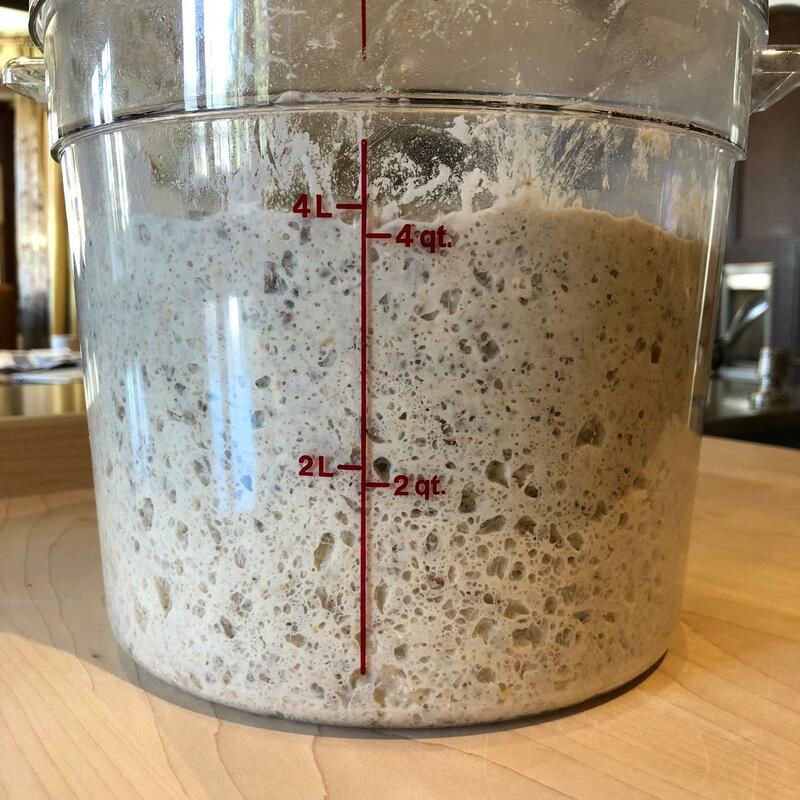 I can say with 100% certainty that the dough was seriously overfermented before shaping, which would explain your dense crumb, lack of rise and pale color. And this is coming from someone who pushes bulk fermentation as far as structurally possible. 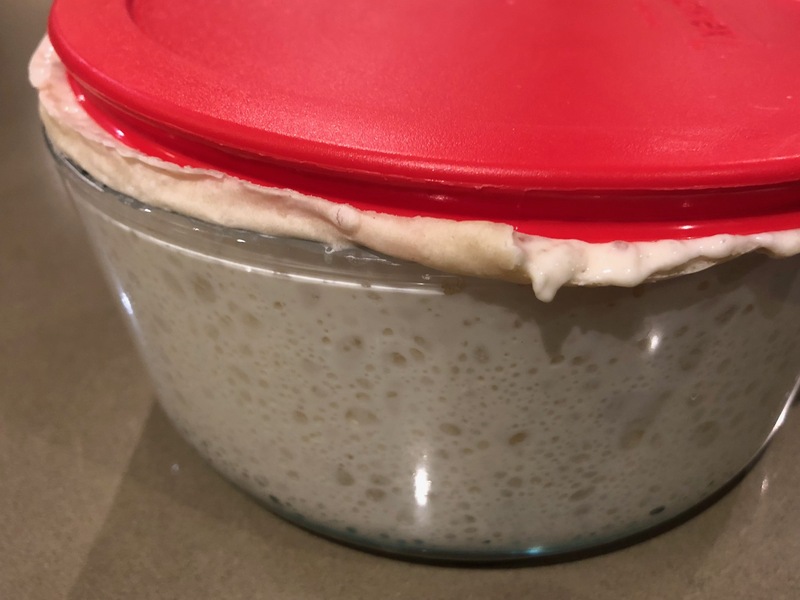 20% very active starter is a ton to use for an overnight no-knead bulk ferment, and would be better suited for a 3-5hr bulk depending on room temperature. All good comments - thank you. I'll usually think of over fermented (and I've definitely been there) dough as being floppy for lack of a better description. 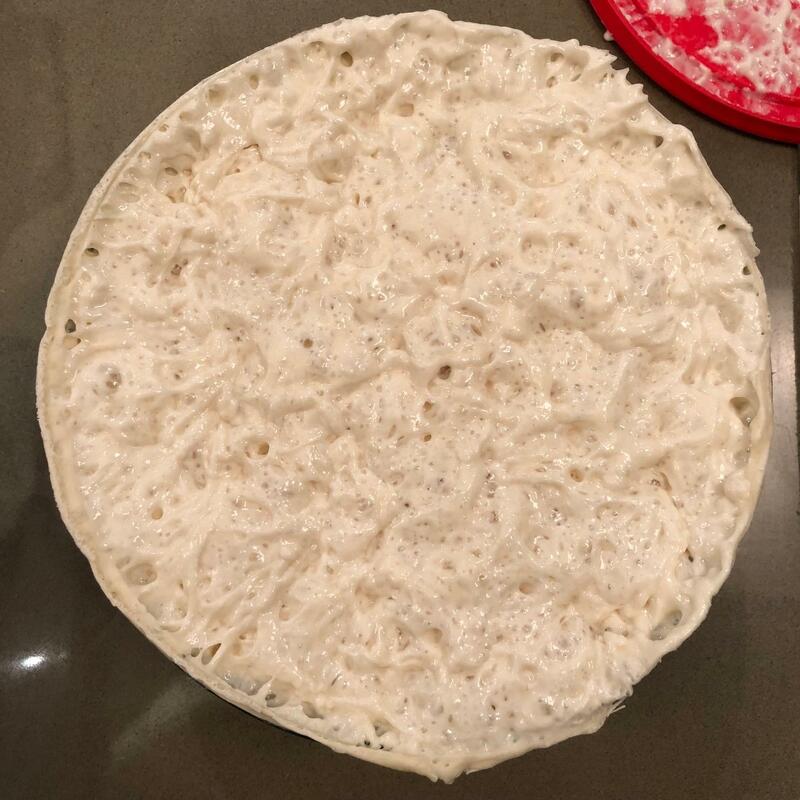 This was firmer, although it did seriously deflate as mentioned, and it didn't seem typically over fermented and floppy to me at the time because the additions absorbed water to create a 'stiffer dough' - I think. 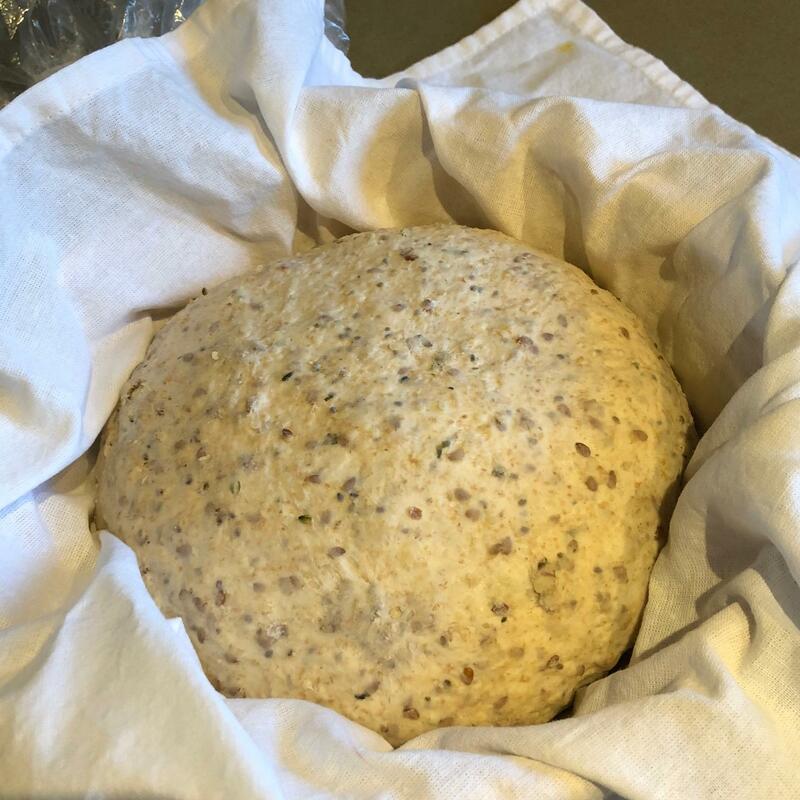 For this type of seeded dough, what would be the most rise you'd look for in bulk and/or proof at this level of additions? Thanks.. 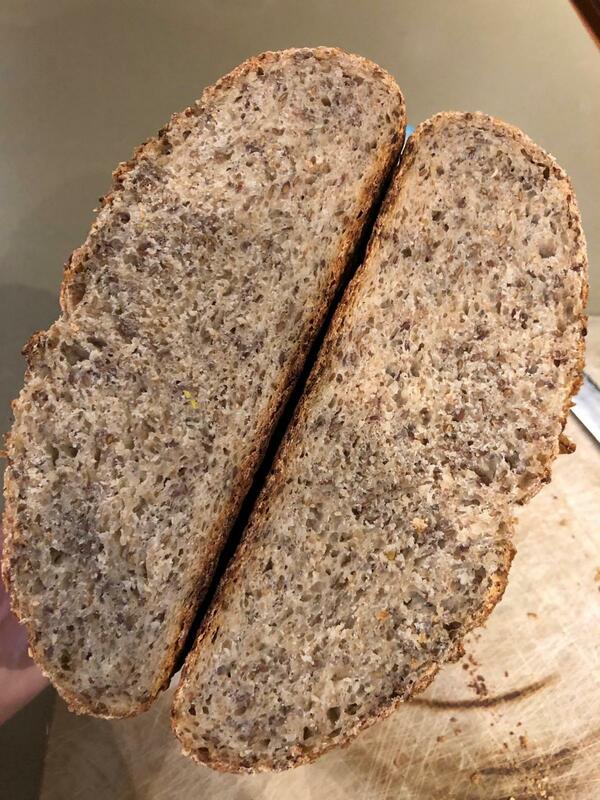 However, in the final analysis, your finished bread is always proof of concept and I agree with Clazar's comments - for a large, unplanned, complex, SD loaf, your bread turned out beautiful - and must be delicious with all the additions! It might be worthwhile to reduce the starter to 10%, convert the bran to a porridge (good idea) and try it again. It does have a great taste and is wonderfully aromatic. 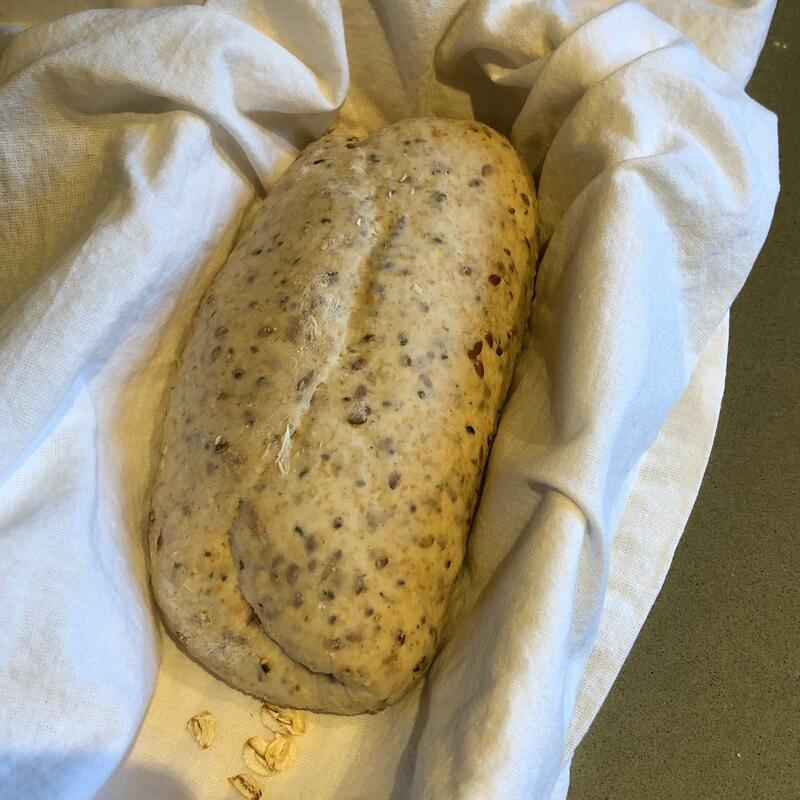 If you've posted your bread, please share the link - I'd like to see it. Thanks for the link and your comments! Those are beautiful ! Great consistency! Swiss Raisin Museli - with a little help from my friends..